Part 1 of 2 in a series. Delva wrote this reflection prior to experiencing the first few days at World Youth Day. 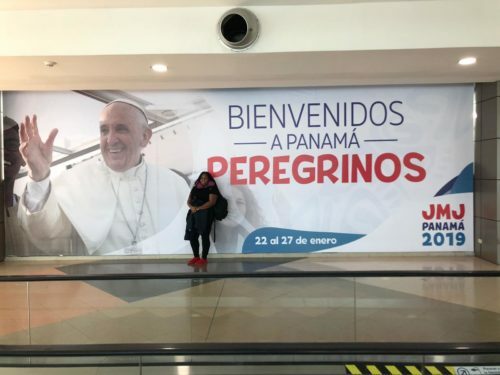 PANAMA CITY, Panama – I wanted to come on this pilgrimage because I believe that there is a transformation to come. I want to be closer to God, to change my heart, to change my ways in ways that give me a better relationship with God and bring me closer to the footsteps He wants me to follow. My older brother actually went to World Youth Day 2008 in Australia and my older sister went to World Youth day 2013 in Brazil and their lives have changed. Now here I am in Panama 2019 with an open heart ready and willing to accept any transformation in any way, shape or form possible. Even if there isn’t any transformation, at least I get to go back home and say I walked the same footsteps as Pope Francis. We look up to the pope as the leader of all the universal Catholic church. I know that coming on this trip with the pope will be the most meaningful journey that I will take this year. Delva is a parishioner at St. Jerome Church, Flatbush, and attended her first World Youth Day in Panama this past January.